A Rich Internet Publication ('RIP', sometimes also named 'enhanced publication') is a digital scholarly publication with additional material, like research data, interactive models, video, a larger set of images than in an average article can contain, or extra information about related topics. There is a growing interest in publishing results together with the underlying data and interactive content. This enables the reader to explore research objects, to experiment with the included data sets and to validate the author's conclusions. The Xpos're tools are designed for authoring and displaying RIPs. Xpos're is flexible and not bound to the common publication structure of specific disciplines. An Xpos're publication can be used as extra "showcase" on a personal or institutional website in combination with a PDF file of an article, which has been published elsewhere. Each slide can be linked to the related page in the PDF, while the added data and functionalities provide a deeper insight in and greater visibility of the research project. The software comprises a Flash-based document reader, which requires text encoded in XML, and a set of extensions (plug-ins) that extend the basic functionality of the reader. For a large part this XML is similar to HTML, but thanks to the additional XML tag names a complex nesting of divs with various class names can be avoided. The extensions are used for display of specific types of multimedia with additional functionality, such as zoomable images, videos and interactive maps. Small, customizable XML templates simplify the authoring process. 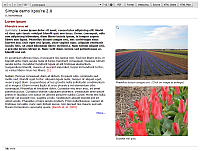 They predefine the position of text columns and images. For each slide the author can deviate from the template and specify positions locally. When fixed layout is not important because fluid output options will be used, positioning can be disregarded. Interactivity means reading on-line, which requires a suitable text: not too long, easily scanned by the human eye and preferably with different levels of detail. Essentials are communicated first, and detailed information should be available for those who want to learn more. Xpos're encourages but does not enforce such a writing style. Each slide may start with a short summary, followed by the core message and optional continuation text of any length. An other feature of RIPs is integration: related parts of the text are linked to each other, discussions on findings are connected to the related data, and vice versa. Xpos're supports these requirements by various types of internal links.